PHOTO BY JIMMY FLINT State Rep. Bill Reineke (from left), R-Tiffin, speaks with Secretary of State Regional Liaison Katie Semo and Seneca County Board of Elections member Mike Bridinger Thursday before a ribbon-cutting at the new elections office, 71 S. Washington St.
Two county entities performed ribbon-cutting ceremonies and hosted a joint open house Thursday at their new locations. 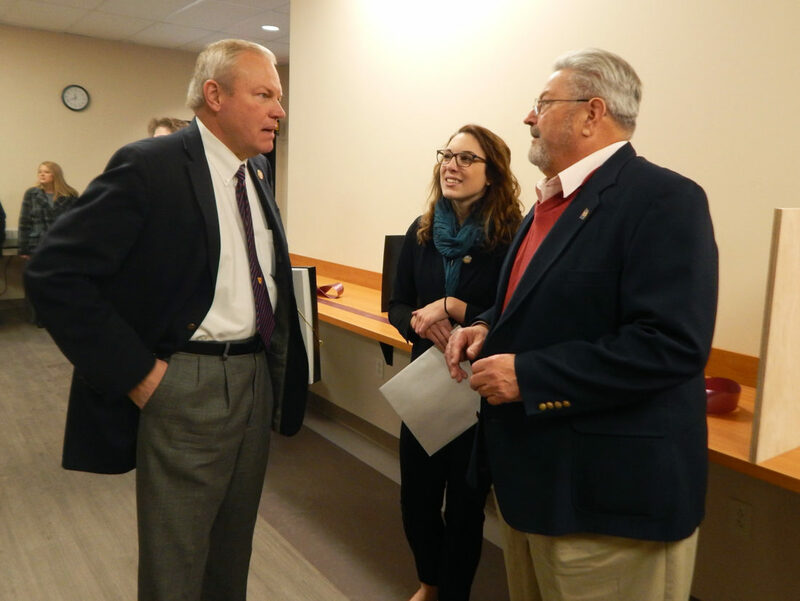 Seneca County Board of Elections showed off its new location next door to its old one in the County Services Building, 71 S. Washington St., before Seneca Regional Planning Commission unveiled its new digs in the elections board’s former space. In March, Seneca County commissioners approved a $151,700 renovation plan for the new board of elections office, which formerly was Hoperoy’s Hallmark Shoppe. Elections panel employees moved into the space Aug. 3. Commissioners voted in May to move the regional planning office from the basement of the RTA Building, 109 S. Washington St., to the County Services Building to give the office more visibility. Federal, state and local government officials joined personnel from the two offices Thursday morning to tour the renovated spaces and participate in ribbon-cutting ceremonies. Representatives for Gov. John Kasich, Secretary of State Jon Husted and Sen. Rob Portman’s office were joined by Seneca County commissioners, Tiffin City Administrator Dale Thornton and others at the event. Reineke presented an Ohio flag and a U.S. flag that were flown over the state capitol building Dec. 19 as a gift to the elections panel. Thornton congratulated elections board officials on the move on behalf of the city. “This new space is going to make a difference, not only in (the lives of election officials) but in the lives of those they serve,” he said. Seneca Regional Chamber of Commerce and Visitor Services President and CEO John Detwiler also congratulated the board, on behalf of the business community. Elections board member Mike Bridinger thanked commissioners for their commitment to finding a better space for the elections panel. Katie Semo, the Secretary of State’s regional liaison for Seneca County, commended the county on its quick renovations and move-in process. “How quickly you got all this together is wonderful,” she said. Commissioner Holly Stacy thanked a class of design, engineering and architectural students at Vanguard-Sentinel Career and Technology Center who helped design the service counter in the office. “What you’re seeing was designed by the students,” she said. After the ribbon was cut at the board of elections, attendees walked next door to cut the ribbon at the new regional planning office. SRPC Executive Director Charlene Watkins thanked everyone for their support. “We love the opportunity to have a little bit better space, the staff is excited,” she said. Watkins said some renovations are meant to be hints about what the community represents. She said a sliding barn door that leads to an office represents the farming community, while the lighting represents the industrial community and the gray paint and wood trim represents the county parks. Thornton congratulated SRPC and said he was happy employees got to move out of a basement. “It’s nice to see them visible again,” he said. Stacy said she was excited to have regional planning in the space under a unique agreement. The deal, signed by commissioners in December, locks SRPC into the space for five years. Last month, Commissioner Mike Kerschner said that because SRPC funded the renovations, commissioners agreed to allow SRPC to occupy the space for three years for free. County Administrator Stacy Wilson said the lease cost for 2021 and 2022 is to be $6,000 annually. Reineke said the regional planning office is among the most important in the county and said many positive things happening locally are because of great planning. “Plan your work and work your plan,” he said. Reineke said he was happy the office is in a better space and happy the organization has a great leader in Watkins.